Today, New Kids On The Block, the multiplatinum selling pop super-group, unveiled an epic lineup for their highly anticipated 2019 tour. NKOTB took to the Today Show plaza to reveal The MixTape Tour with very special guests Salt-N-Pepa, Tiffany, Debbie Gibson and Naughty by Nature. The five iconic pop and hip-hop acts will hit the road together for the first time ever on a 53-city tour across North America next summer, with a stop at Golden 1 Center in Sacramento on Thursday, May 30, 2019. Tickets will go on sale to the general public beginning Friday, October 12th at Golden1Center.com. American Express® Card Members can purchase tickets before the general public beginning Tuesday, October 9th at 10am local time through Thursday, October 11th at 10pm local time. 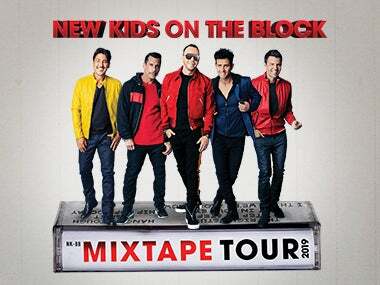 NKOTB made the announcement on the heels of their SOLD OUT Apollo Theater show celebrating the 30th anniversary of their hit packed, breakout album Hangin’ Tough. The special one night only engagement sold out within minutes of onsale and saw NKOTB gracing Harlem’s famed Apollo stage for the first time since they debuted “Please Don’t Go Girl” at the Apollo’s notoriously tough amateur night. The career defining album,Hangin’ Tough produced hits like “Please Don’t Go Girl,” "You Got It (The Right Stuff)", “I'll Be Loving You (Forever)", and “Cover Girl.” The crowd erupted when the band confirmed on stage that Hangin’ Tough will get a special anniversary re-issue in early 2019 with new, never been released music. Produced by Live Nation, The MixTape Tour will embark on its three-month journey beginning May 2nd in Cincinnati, OH and make stops in Nashville, Dallas, Los Angeles, Atlanta and more, before wrapping July 14th in Hollywood, FL.